Shortly after hurricane Gustav blew through the area, my son, was asked to go assist in the clean up at a local feed and seed that his cousin worked at. He loved working there and they were thrilled to have him so he continued on after the clean up was complete. Not too long afterwards he came home and announced that he would like to get some chickens. Growing up we had horses and cows, and ofcourse dogs, but never chickens. I knew absolutely nothing about raising chickens, but I thought for a 14 year old there were a lot worse things he could be interested in so I went online to do some research. First thing decided what type birds we wanted to raise. Eggs were the primary concern, but meat birds were also a possibility, and the choice came down to either Rhode Island Reds, or Barred Plymouth Rock. My son chose Barred Rock, and I think he chose wisely. Then I did some research to decide what we needed to house them. Much to my surprise, my interest in all things chicken, seems to be quite common as I found numerous sources of information. I came across BackYardChickens and was hooked. Looking at the examples of coops , we found one that we thought would fit our needs. 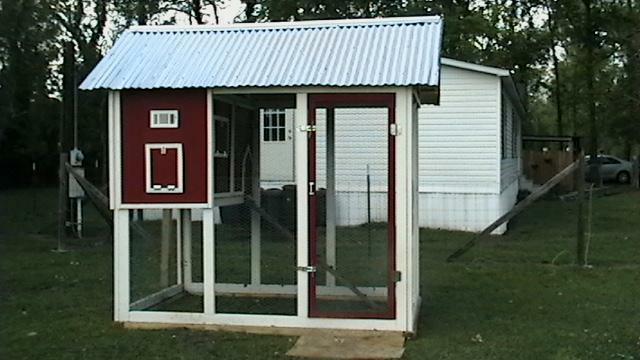 While we have much room to expand I wanted to start small and manageable until we decided if chickens were for us. Not being a carpenter I found some that looked relativley simple to build. Looked at the pics and went to work. It was a family project with my wife, daughter and son all pitching in to build our coop. This is a picture of it once complete. Shortly prior to finishing it we ordered our chicks from Mt Healthy. 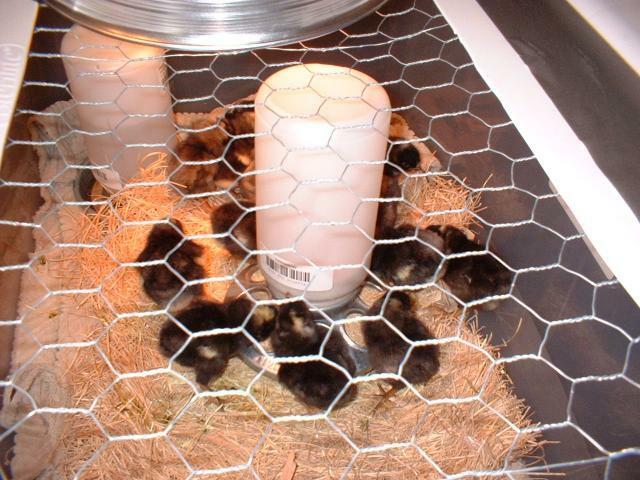 they were hatched on March 18, 2009 and shipped on March 23rd. We ordered 15 since it was the minimum and a straight run. It was my intention to keep 1 rooster and 4 hens. (We ultimately kept two roosters since my daughter wanted one as well) Here they are on their first day. Our brooder is a tupperware container bought at WalMart. I cut a hole in the top and stapled chicken wire to it, and put a heat lamp on top. worked perfect and our chicks spent the first few weeks in it quite cozily. When they began to get crowded I moved them out to the coop. During the day it was cool but not too cold so I let them run around on the ground. 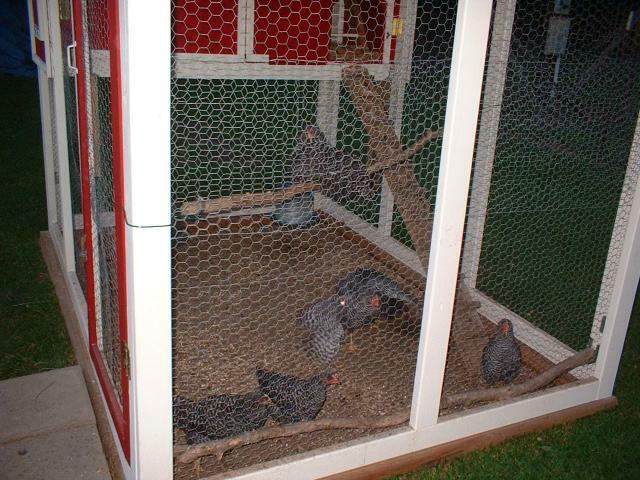 In the late afternoon when it began to cool off I put them up in the box under a heat lamp and shut them up in the box. The nights were pretty chilly but the lamp kept it warm enough for them. They are now almost four months old and I leave the door to the box open and in the evenings they put themselves to bed. As often as possible we let them out of the coop to wander around the pasture and yard. They like getting out and pecking around in the green grass. They stay pretty close to home so I'm not concerned about them running off but have to keep an eye on them to keep dogs and other would be predators running around from getting to them. Our yard is fenced in and we have begun to put them in the yard so nothing can get to them. In the evening when it begins to get dark they go back to the coop and put themselves up, it's kinda funny to watch. July 9, 2009. Got a call yesterday morning from my daughter who was very excited to tell me our roosters were Crowing! I had heard one last week attempting to crow, apparently they've figured it out. we are still waiting on our first egg. August 7th, 2009. Every morning as I'm leaving for work the two boys are crowing up a storm. They are also getting thier spurs on (small bumps at this point). The girls have still produced no eggs but they are only 20 weeks old, so I will be patient a while longer. Once they are laying and actually giving me a return on my investment, lol ( they would have to lay golden eggs to pay me back for the coop, feed and time) I intend to build a new coop with a bigger run and get a mixed flock of chickens. So yes it's addictive! Sept 15th,2009 14 eggs in twelve days. Still don't think all four are laying we are getting two a day right now(and for the last three or four days or so) Last night for supper we finally ate some of our eggs, quite a treat! Sept 17, 2009 Been steadily getting two eggs per day, well yesterday afternoon was the first day we got three eggs! October 6, 2009 Getting three eggs per day fairly regularly now! Our girls are doing great! Even managed to have enough extra to give a couple dozen to my sister and my mother in law.! Barred rocks- ROCK! January 8th, 2010 BRRRRRRRRR literally freezing down here. My two roosters finally stopped getting along so well and we had to put one in the freezer, the hens are still laying very consistently. 4 eggs per day most of the time and a couple days a week we get only three, but with the shortened days of winter they have maintained well. Going down to 18 tonight, so we shut them up tight in thier box with a heat lamp and they seem to be quite cozy so all is well. Looking to add a new bigger coop in the spring which I hope to add another 10 hens or more, lots of people wanting fresh yard eggs, so we'll see. Happy New Year ! Would have liked to have information on how this was built, dimensions, cost, etc. More pictures (including an interior photo) would have added to the article too. Could you add more photos please. I enjoyed reading your journal and wish you continued success.